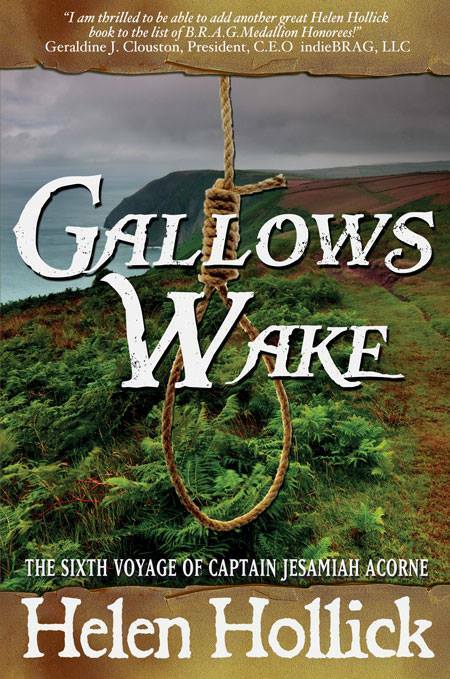 Helen Hollick - Reviews - "Gallows Wake"
The sixth voyage of Captain Jesamiah Acorne. Approaching England's North Devon Coast Captain Jesamiah Acorne is worried. A Royal Navy frigate is trailing in his wake and Sea Witch has a hidden cache of brandy and indigo aboard. His instinct is to hoist full sail and flee, but he cannot attract attention, for his wife, Tiola, is ill and getting worse. She says the sea is affecting her, but Jesamiah has never seen seasickness like this before - is it something worse; something to do with her being a white witch perhaps? Like an approaching storm, his worries get deeper, darker and more sinister. Tiola's brother, Ben, is in gaol, arrested for smuggling. At a loss of how to help him, opportunity comes in the unexpected form of Sir Ailie Doone - the last of the notorious Doone family of Exmoor. He offers Jesamiah a highly secret but lucrative commission to go to Spain and bring back to England a man who will lead a Jacobite rebellion. It seems an ideal solution, but first Jesamiah must break young Ben out of gaol. Once escaped from the threat of the gallows, the boy can sail with Jesamiah on the Sea Witch leaving Tiola ashore to recover in peace. Except, being captured and interrogated by the Spanish and meeting with an old friend, the beautiful English spy Francesca, is not part of Jesamiah's plan. Once again he is in danger of losing his fidelity, his freedom and maybe even his life. Tiola meanwhile, has her own fears to face. Why is the ethereal spirit of the sea, Tethys, so determined to have Jesamiah for her own? To save him, Tiola must find a way to recall her previous lives and discover why events of the past have influenced the hatreds of the present. Curiosity was not one of Jesamiah's faults, especially when it involved taking onboard people he did not know and did not want to know. If whoever it was desired a free passage to Bideford he could bide his time on deck. There was no code that decreed a ship's captain had to be polite to irritating and unwelcome passengers. To add to his annoyance, as he stepped into his cabin Tiola was dressed and about to throw a cloak around her shoulders. "You can take that off and sit yourself down, young miss. I told you, it's cold out there, and you are not well." Ignoring him, she wound a shawl over her head and opened the door. "I need fresh air Jesamiah. I'll stay in the waist, not go for'ard or on the quarterdeck. No steps or ladders." Sighing, Jesamiah retrieved his hat and coat which he had tossed on to the table, already cleared of the breakfast debris. "I'd better come with you then." Tiola reached up to place a delicate kiss on his cheek. "Don't be silly, I will be perfectly all right. Look here's Finch with coffee for you." She ducked out as Finch came in, pre-empting any more protests. Jesamiah meant well but she wanted to be alone, wanted the fresh, crisp, air that might clear her aching head and give her a chance to think. "You fuss more'n a mother 'en you do." Finch stated. " Leave the lass be, she needs a bit o' space round her." "When I want your advice I will ask for it. Does that liquid you're pouring actually have any coffee in it? Or does it taste as revolting as it looks?" For all his grumbling, Jesamiah took the proffered cup and sat at the desk shaped into the curve of the bulk head - light oak wood to match the rest of the panelling, with oak leaves and acorns carved here and there. This cabin was one of the things that had attracted him to the ship in the first place, that and she was the most beautiful vessel he had ever seen. He had won her in a card game, although he had ended up stealing her for the owner had gone back on his word. Water under the bridge now. The man was dead, and Sea Witch was unequivocally Jesamiah's. As much a part of him as his soul. "Hollick deftly weaves magic with history to create a spellbinding account of Blackbeard's last days, leaving the reader filled with awe, remorse, wonder, and horror." "Helen Hollick's writing is very rich and lush. I'm very impressed."